If you are not completely satisfied with the appearance of your front teeth, you should know that smile do-overs are possible with porcelain veneers. These thin, tooth-shaped layers completely cover the surface of the teeth that show when you smile, erasing even the most significant cosmetic flaws. Porcelain veneers in Richmond are completed in just two visits with Richmond cosmetic dentist, Dr. Vong. How do porcelain veneers work? What are the benefits of porcelain veneers? And are you a candidate for the cosmetic treatment? Let’s take a look at these and other important questions regarding porcelain veneers. What Are Porcelain Veneers? How Do They Work? Porcelain veneers are tooth-shaped coverings that are bonded to the surface of the teeth that show when you smile and speak. They work simply -- by just covering up the flaws to remake your front teeth. Dental porcelain is a sturdy material that looks and acts like our natural tooth enamel, and the results are truly stunning. Even better, porcelain doesn’t discolor or stain at the same rate as tooth enamel. That means your veneers stay the same shade of white from day one, and for years to come. What's the Procedure for Porcelain Veneers? Porcelain veneers are a minimally-invasive procedure completed in two visits to VL Dental. In the first, your dentist puts together a treatment plan based on your smile goals, prepares your teeth for placement, and then attaches temporary veneers. Your permanent veneers are artfully crafted in between appointments. 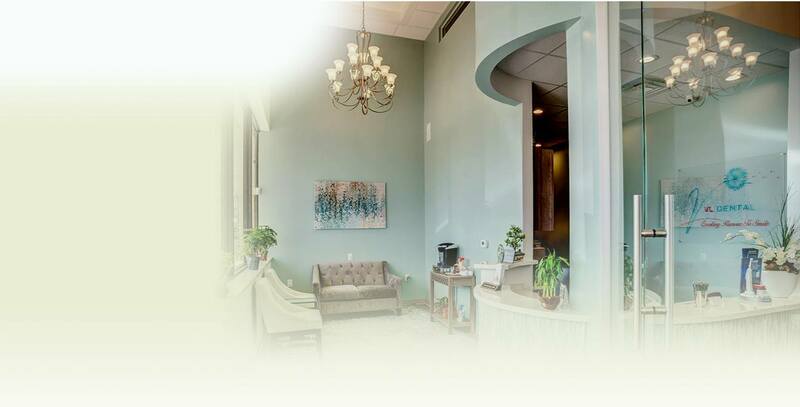 Once they are ready, you return to our office for the placement of your permanent veneers. One of the most significant benefits of choosing porcelain veneers is the fact that rather than undergoing multiple cosmetic procedures, you can have all your flaws erased at once with porcelain veneers. Additionally, porcelain veneers stay are highly resistant to stains, so you can eat and drink what you please without worry that you are gradually discoloring your smile. And when cared for properly, porcelain veneers can last for years and years. Most patients who wish to remake the appearance of their front teeth are eligible for porcelain veneers. Adults over the age of 18 who are in good oral and overall health are generally suited for the procedure. Cases of gum disease and tooth decay should be treated in advance of porcelain veneers. Sometimes, porcelain veneers can eliminate the need for braces. People who have severe crowding or significant gaps between the teeth, however, will benefit most from traditional orthodontics. Let's Discuss Your Smile Makeover Today! We want to help you enjoy all the benefits of a smile that's as beautiful as it is healthy. Porcelain veneers are a wonderful method for transforming flawed teeth. Let’s discuss what’s possible with your smile -- contact your dentist in Richmond to schedule an appointment today!